You're nicking the WRONG people! North Wales Police have caught themselves out, without even noticing. In a spectacular display of ineptitude North Wales Police have admitted that their speed cameras are targeting the wrong drivers, and they didn't even know they were admitting it. Accident involvement data from (RAGB) table 6c. 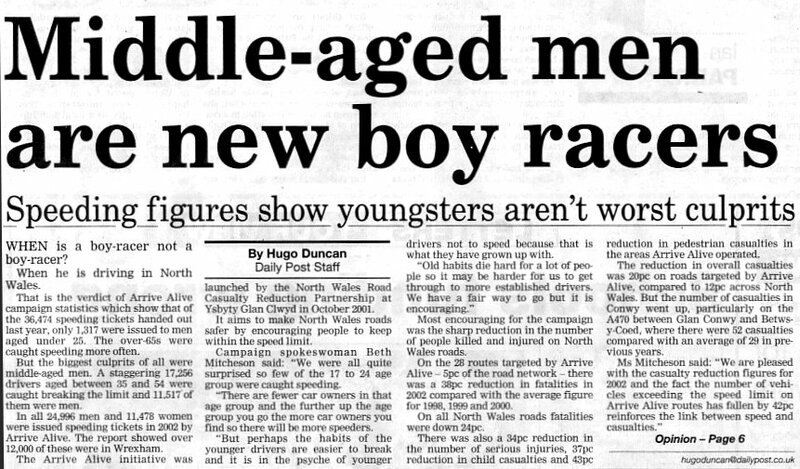 Some adjustments are required to match the age range claimed by North Wales Police, but the max expected error is under 1%. It's probable that the ratio of tickets reflects the ratio of the traffic, but it clearly does not reflect the ratio of accident risk. You do not need to consider the ratio of young drivers to middle aged drivers in the traffic to know that the systems is missing its mark. For example: Even if the dangerous group of young drivers only made up 1% of the traffic they are still responsible for 25.5% of the danger, and if the cameras targeted them correctly they would still get 25.5% of the tickets. Inexperience, implies undeveloped hazard perception which implies failing to slow down when necessary and unsafe speeds. So we really must expect the young to be worse speeders. After all it's poor speed control which will be a significant component of their accident involvement. And we're not talking about speed limits, we're talking about the unsafe use of speed. But even this hasn't enabled the North Wales cameras to identify them. Everyone knows from insurance adverts that middle aged drivers are the safest group and pay the lowest insurance premiums. And everyone knows that young drivers are a dangerous group. There's a brief report (here) Yet it's the middle aged drivers who have received the greatest proportion of the tickets. This is clear proof that speed cameras target safe and dangerous drivers and behaviours entirely without beneficial discrimination. Exactly as we've always claimed. There's even a suggestion of negative discrimination, meaning that safer drivers have been prosecuted in greater proportion. "A total of 80% of fatal car crashes involving speeding in Northern Ireland are caused by men between the ages of 17 and 24, it has been revealed." So that's 3.6% of under 25s get speeding tickets in North Wales and 80% of under 25s cause "speed related" accidents in Northern Ireland. That's a ratio of 22:1 Does anyone smell a rat? How on earth can anyone suggest that speed cameras are going to make a difference? They don't catch the right people. Other claims - they are joking. "Crashes down by 80%!" and "KSI down!" Are typical of the daft, erroneous and misleading claims made by the spin doctors at the speed camera partnerships. The other claims in this news clipping are no exception. We recommend understanding the methods that they use to create the misleading figures, and especially the "regression to the mean" error. We have documented the sorry process (here). The National accident trends are really rather bad; the worst we've seen in the UK since the 1960s. We have a full collection of graphs (here) and an analysis of the fatal accident trends (here). Don't believe a single claim that the speed camera partnerships make until you see the benefits in the national accident trends. (which, of course, you won't). Subject: Road casualty figures - the reality. I regret to advise you that some of the road casualty figures in your article are misleading. I assume that you were given them by the Arrive Alive people, who, in common with many police forces, are prone to selective presentation to give the impression that their policies are succeeding, even when they are not. You state that 'there was also a 34% reduction in serious injuries' on roads targeted by Arrive Alive - but on all roads, serious injuries were down 17% compared to the 1998-2000 baseline and UP 1% compared to 2001. On the basis of the real figures, I see no reason to believe that the Arrive Alive policies - including the increasingly venomous campaign against drivers who, as it happens, have one of the best, if not the best, accident records in the world - are having any beneficial effect. Comments on the above are welcome. If there is a demand we will create a comments page. We will be delighted to publish all suitable emails including those whose content we disagree with. Email comment.